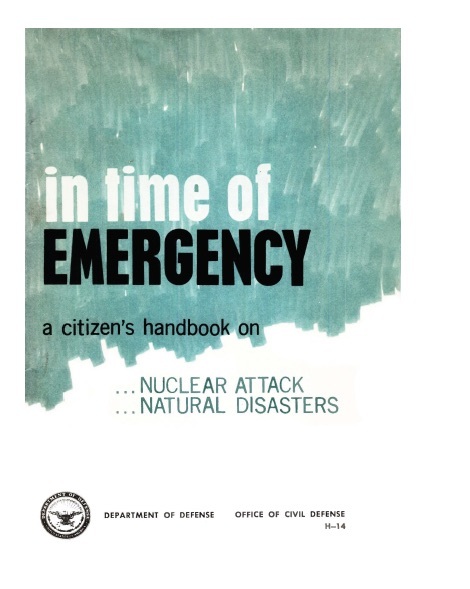 the Demented, a 1968 artifact I found in my in-law's basement some years ago gains new relevance: "In Time of Emergency, a citizen's handbook on Nuclear Attack [and] Natural Disasters." 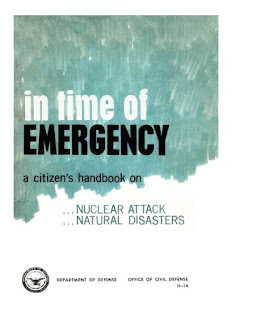 The Department of Defense, Office of Civil Defense published this the same year "Planet of the Apes" hit theaters with its famous shot of a broken Statue of Liberty in the sand after homo sapiens destroyed society in a nuclear war. But in the DoD's e=mc2 zone, despair isn't the message. Normalizing nuclear war is. Think of it as just another severe weather event with radiation, emceed by the Weather Channel's Jim Cantore. 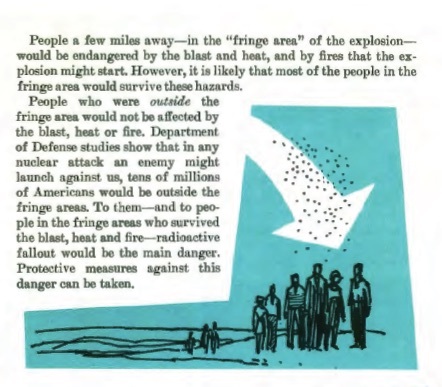 Sure, the keep-on-the-sunnysiders admit, "people who happened to be close to a nuclear explosion probably would be killed or seriously injured," but "it is likely that most of the people in the fringe area would survive these hazards." So hopeful fringe-dwellers need to move on to "Understanding the Hazards of Nuclear Attack." "It is possible," the reader is advised, "but extremely unlikely—that your first warning of an enemy attack might be the flash of a nuclear explosion in the sky." Although you won't need any advice following that flash because it will be the last thing you ever see, readers are helpfully directed to "TAKE COVER INSTANTLY." "By getting inside or under something within a few seconds, you might avoid being seriously injured." You can take cover "in any kind of building, a storm cellar…or even in a ditch … or storm sewer …If no cover is available simply lie down on the ground and curl up." Presumably the reader can finish the phrase. If you're not out strolling under the air raid sirens, "Keep some of the intense heat rays from nuclear explosions from entering your house by closing your doors, windows, venetian blinds, window shades and drapes. If the climate will not permit this…close as many as possible, then close the rest when the Attack Warning Signal is given." An atomic blast is "several million degrees F within one-millionth of a second following detonation" according to the Atomic Bomb Museum. Prayer seems more useful than closing the blinds. At least the flash won't fade the upholstery before everything's incinerated. Post-blast firestorms don't need to worry you, though, according to these irrepressible optimists. "Your home might be saved if you know how to fight fires and have on hand some basic firefighting tools. These include a garden hose, a ladder, buckets filled with sand, containers filled with water, and a fire extinguisher." And, "Remember the 3 basic ways to put out a fire." Something else to remember: the firestorm from the atomic bomb the U.S. dropped on Hiroshima in 1945 leveled almost the entire city. It's unlikely that happened just because residents didn't have sand buckets. If you survive to this point, you will have to think about radiation. But there's no reason to go all silly about a few gamma rays and stray neutrons. the blast, heat or fire"
their own bodies." Thus, "Only simple precautions would be necessary to avoid swallowing the particles." In case you step out without your lead raincoat, the DoD offers first aid tips. If exposure is "a small or medium dose" the "body will repair itself and he will get well." In fact, there's nothing here requiring more than the most commonplace medical treatment. "If a patient has headache or general discomfort, give him one or two aspirin tablets every 3 or 4 hours." And, "Remember that radiation sickness is not contagious or infectious and one person cannot 'catch it' from another." Otherwise there night not be enough aspirin to go around. 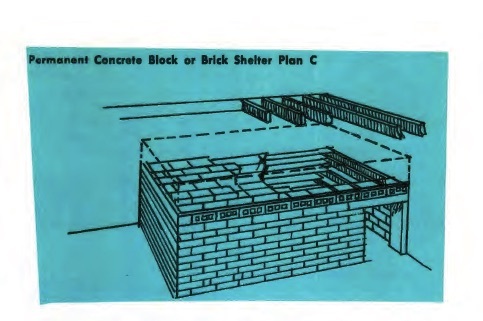 Radiation calamities are easily avoided by a handcrafted fallout shelter, according to the DoD. "It can be any space, provided the walls and roof are thick enough," the authors explain breezily. "Usually, householders can make these improvements themselves, with moderate effort and at low cost." If your go-to home improvement method is Angie's List, I can report there's an Angie-certified bomb shelter builder who will construct your bunker out of steel, fiberglass or concrete and chock full of amenities from carpeting to a built-in weather band radio. Once you're snug in the crypt, the discussion turns to quotidian matters—such as the "emergency toilet," on the off chance the municipal water system is hors de combat. "It could be a garbage container, a pail or bucket … [and] could be fitted with some kind of seat… remove the seat from a wooden chair" and "cut a hole in it." Ouch. The DoD atomic experts aren't mere utilitarians, however. They reveal themselves to be as alive to the gentler side of things as the World Happiness Council when they turn to the subject of recreation. Just because you're living on spam and using a trashcan for a commode doesn't mean you can't profitably beguile the flashlight-lit hours in the bunker. Stock up on "books and magazines"—perhaps those back issues of the New Yorker that have been piling up. Or "writing materials" and "hobby supplies"—it's a perfect opportunity to finish that knitting project you started 17 years ago. And don't forget "a sewing kit and toiletries such as toothbrushes, cosmetics and shaving supplies." After all, you don't want to greet Armageddon missing a button, without your lipstick and your personal correspondence in arrears. To learn more about the age of the atomic bomb, plan a trip to the National Atomic Testing Museum in Las Vegas, or visit "Nuke York, New York: NuclearHolocaust in the American Imagination from Hiroshima to 9/11".